LDL: The Italian Westerns used the soundtrack differently; why this particular attention to the soundtrack? Duccio Tessari: I don't think that is a fact concerning quality. I mean that Morricone, Ferrio, Travaioli, took the classic music themes in a new way. But in our Westerns, and here's the difference, the noise - the punches, the gunshots - was exaggerated, expressive, never real. During the sound mix, inorder to avoid the music getting covered by other noises, we tended to set the volume higher. I remember Sergio Leone in the dubbing studio calling to the mixer, "Bartolome! Make the blows louder! Bartolome!" 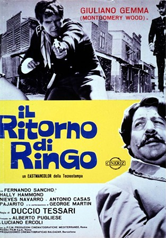 LDL: American critics didn't approve of the Italian reinterpretation of the myth, but wasn't your Ringo a success in America? DT: My films, Corbucci's films, and Leone's films were successful everywhere in the world - Japan, France, Germany, Hong Kong. Americans had to accept what was going on and showed our Westerns, too, and they were successful there, too.